Released in February 1989, "Like A Prayer" was yet another 80s video to cause much controversy! Soft Drink giant Pepsi, decided to use the song as part of a commercial featuring Madonna. The company struck a deal to sponsor her 1990 Blond Ambition Tour. The commercial aired twice before the release of the music video on MTV. Unfortunately, Pepsi was unaware of the video's content. Directed by Mary Lambert, in the video Madonna witnesses the murder of a white girl by white supremacists, with a black man being wrongly arrested. Madonna takes refuge in a church and dreams of kissing a black saint (St. Martin De Porres), displays stigmata after cutting her palms on a knife, and dances in a field of burning crosses - just how did they miss all that? Of course, some religious groups became rather angry and threatened to boycott Pepsi, who in turn decided to cancel the ad campaign and tour sponsorship, although Madonna kept the contracted $5 million. 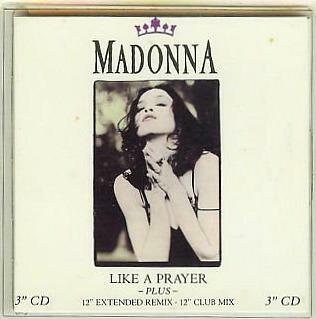 No doubt, all the controversy helped to ensure that Like a Prayer was one of Madonna's biggest-selling singles, selling over five million copies world-wide during 1989.